My name is James Stafford. Today I'm going to show you something unthinkable to most investors. Namely, that a market advantage DOES in fact exist. Today you are going to learn something about the energy sector that fewer than 1 in 10,000 professional investors know. How would you like to have "insiders" telling you about big events every day in the energy markets, before they happen? But I also like to call them PRICE SHOCK events. But investors who act on them can make tremendous gains… literally overnight. So who are the people that get information like this first? Insiders in the energy markets. To be clear, I’m not talking about insider information. Recently our network of insiders gave us notice that the Federal Energy Regulatory Commission granted final license to this company’s liquid natural gas terminal. Nineteen months later it rocketed to a 291.5% PRICE SHOCK. In this case our Intel network picked up the fact that this particular miner drilled below and parallel to an existing mine… one already exceeding expectations… and discovered a new high grade gold and silver mine. The end result: A 39.7% PRICE SHOCK nearly overnight. We got word that a little-known Canadian manufacturer was on the brink of profitability... in a market that was about to make the news cycle... fuel cell manufacturing. Soon after it experienced a 514.2% PRICE SHOCK. This company came to our attention when we learned Lord Jacob Rothschild acquired a significant stake in the company. The reason: An announcement that an exploration of a shale bed off the coast of Jerusalem could bring energy independence to Israel. A short time later… after this became widely known… it jumped 66.7% on this PRICE SHOCK. Since I’ve been at the helm of OilPrice.com in 2009 I’ve seen this type of scenario play out hundreds of times. And, a short time later, they ride the PRICE SHOCK up. We simply provide the best fully global energy Intelligence service in the world. 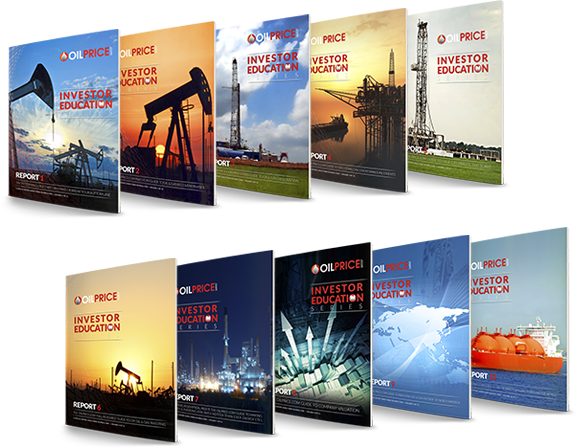 In 2009 I founded OilPrice.com as a boutique energy intelligence firm. As well as high-level industry and government sources. And CEO’s at hundreds of energy sector players. Informants at the group, community, tribe… and even street level in almost every country on Earth. When we dig in to an opportunity for our clients our goal is to know more about the company than even the CEO does. And our track record has been stellar. All adding up to hundreds of thousands of percent in gains. This has allowed our communiqué readers to get in to a position… ride the PRICE SHOCK… and get out of it with some incredible gains. We have what we call an asymmetric information advantage over the rest of the market. Recently, a little-known company opened a rare earth mineral mine… one that was shaping up to be the worlds second largest. But it wasn’t until our network got first word that a group of 20 US senators and congressmen were successful in getting the Department of Energy to provide a $280 million loan that we recommended it. Within six months this PRICE SHOCK was up 104.3%. We uncovered a unique licensing deal that allowed a power management company to get guaranteed revenue whether or not their service was used. Even better, they get paid extra when it is. As soon as these details became widely known it rose 52.7% on the PRICE SHOCK. It happened again when our agents picked up on a story coming out of a uranium producer. Here’s what most investors didn’t know: They just received all of their permits and revealed they had off take agreements in place. We dug in and found out they were also in line for a $20 million loan to complete the project… a risk-free project. The end result: A 62.5% PRICE SHOCK. In short, we’ve proven over and over that market advantages DO exist. But the problem in the information age is that 99% of the market gets the same information at the same time. Or from an analyst who sits at their desk all day. Or from some so called financial guru who gets all of his information from the Internet. And that’s from people in the know… with boots on the ground. Local information… that’s then vetted for accuracy… and then put in the context of the market. Not too long ago a shale gas company’s executives revealed during a meeting that they were the largest operator of unconventional shale projects in California. My team then dug in and learned 25% of their total output was in the region... and they were ready to roll out the largest 3D seismic survey in California's history. One of the most interesting recommendations that we’ve had in recent memory included a Warren Buffet plot line. In Hong Kong it was revealed that one of Buffet’s holding companies might buy a little-known Chinese solar panel producer. It jumped higher. And soon after it experienced an additional PRICE SHOCK when China announced a plan to quadruple its solar capacity… and is up 387.5% since we first issued a communiqué on it. The result: A 387.5% PRICE SHOCK. This year our best recommendation so far was on a different solar company. This company was far off the radar of even the big players in the energy market… a little-known solar utility in the middle of Texas oil country. The stock was down because there was concern that the expiration of the $84 billion Section 1603 treasury grant program would hurt many solar providers. However, one of our assets conducted a public interview with the CEO of the company who expected them to be retroactively renewed. And since January 1st it’s up 1,086.6% on its PRICE SHOCK. That’s right… up over 1000% already this year. I doubt any other firm on the face of the Earth rivals the information network we’ve built. First, ALL of the Intelligence we collect is from public sources. This is NOT “inside information” we’re getting access to. It’s, as I’ve said an asymmetric information advantage. What that means simply is that one group of market participants… our network of insiders… simply makes it their goal to know more than everyone else. Second, we never make a recommendation simply on what one source tells us. We then reach down to the roots of our network to verify its authenticity and investing value. If a company isn’t already on our radar our research team digs in to perform a fundamental business analysis. If they are on our radar we update our company dossier. At that point my two top investigators bring all of these assets together and make a recommendation. Not only are they skilled in the arts of Intelligence but they both have over a combined 35 years of forensic or international accounting experience. 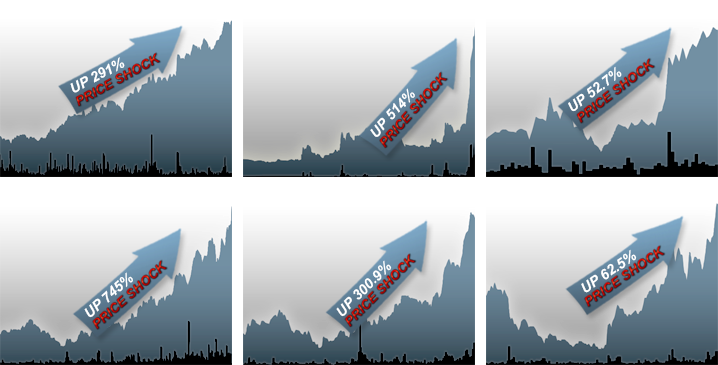 It’s only when they are 99% certain a stock will rise at least 30% or more that we issue a recommendation. We'd rather make a 30% gain with 99% certainty than a 600% gain with 10% certainty. 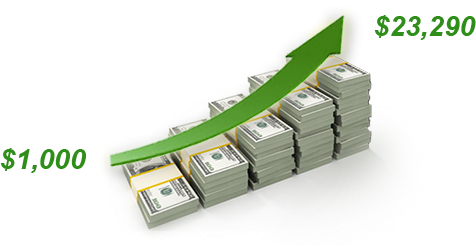 But, as you’ve seen an information advantage like this does lead to some incredible gains. And today, for the first time I’m opening up this private communiqué service to a very limited group of individual investors. The service is called quite simply Special Situations. In it, you’ll get the exact same recommendations we give our institutional clients. But to a very limited group… as you’ll see. In fact, you might not even be able to get in. The goal of the service is to provide recommendations that have a 99% chance of going up 30% or more in a month. 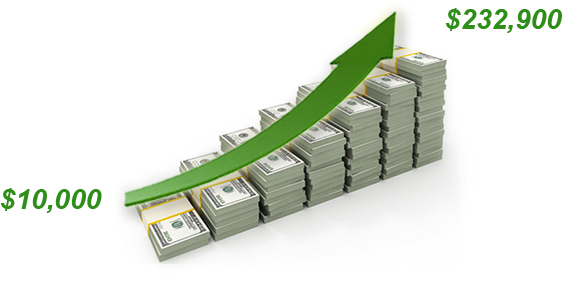 If you reinvest 30% winnings every month you’ll have an 88% chance of making 2,329% in just a year. Now will every recommendation make 30%? Or over 1,000% as you just saw? The point here is that the leverage a network like this is able to give you a tremendous advantage over the rest of the market. Up 300.95%... Up 294.7%... And Up 745.1%... on three solar companies discovered to have a net energy ratio of 10:1 before Wall Street piled in. Up 86.9% on a Silicon Valley technology company whose CEO not only moved to China... but moved annual shareholder meetings overseas too... and then got written in to China’s 5 Year Plan. That just a few special situation trades like these are likely to make you a lot of money. You could turn every $1,000 in to $23,290. Of course, we're not always going to have big gainers... but the point here is that this might be the last best way to invest in today’s market. So how does the Special Situations service work? You receive our trade recommendations in your Inbox. You ride the PRICE SHOCK. You get out with your gains. I have my two best qualified assets running this service. But the first is as big an insider as you can get. He has over 35 years of experience as a CFO of two privately held energy companies. He was head controller of Hess’s US exploration and production division. And, in addition to the OilPrice.com network, he has his own hub of over 500 high net worth individuals invested in the worlds energy markets. He works in tandem with my second asset. And has been an international accounting and auditing specialist at Hess, British Gas, Tenneco and Petrobras. And, without a doubt, she’s the best I’ve met in my career at squeezing the real story out of some industry insider. But you have to decide right now if this type of service is for you. AND an 88% chance of making 2,329% or more over the coming year if you decide to reinvest your winnings each month? Or are you completely happy with what you are doing now? 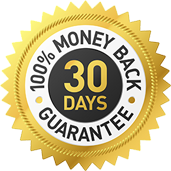 If not, then I’ll give you 30 days to try out our Special Situations service. But you need to get in now. I have a hard cap on the number of public memberships I’m making available. Once they are all filled we close the doors on this opportunity. We need to do this because some of the companies we recommend… as you’ve seen… will be small caps. And get out with our gains. So the 1,000 273 Special Situations memberships we have left are first-come first-serve. You may even find that… after you click to review your order… these memberships are all filled. If that’s the case then you’ll have to add your name to our waiting list in hopes of getting into a future opening. So if memberships are still available I highly recommend you secure one. My team is currently investigating three PRICE SHOCK situations we could get in to the next trading day. I can't reveal too much but two opportunities have more than a 50% upside over the coming weeks. The first one has spun off a subsidiary LLC that could soon become a publicly traded MLP. The second one is an energy corporation that just entered an incredible agreement to acquire 24,000 prime acres in the Utica Shale. The third one could rise 200% or more... a lot more if oil prices climb at any point. The CEO went on record saying his SCOOP and STACK plays were providing "strong and improving returns at today's oil prices". All three opportunities are currently being completely vetted throughout our network… and my two best assets are making sure the financials line up. And all of the Intel on it. On average you’ll receive one recommendation every two weeks. We’re not day trading in our Special Situations service. This is about finding stocks that have a 99% probability of rising 30% or more. And even with the entire power of our network these opportunities are rare. The good news is that, at most, you only need to spend 20 minutes a month of your time reading our communiqués... and making your decision to enter a position or not. We’ll also send you updates on open positions… as well as alerts when it’s time to take our profits. Now’s the time to act decisively. You'll be able to find out in a moment. But I’m sure you are wondering how much a service like this costs. Let me say up front that I’m not going to be able to offer a huge discount. How much is it worth to gain access to gains like these? To hear what’s being whispered behind the scenes of the worlds energy markets by insiders? How much is it worth to get in on these types of special situations? We’re making this intelligence available to 1,000 273 individual investors. Since we're just launching the service I want to get the first group in as soon as possible. So, if you are one of these first 1000 in you’ll get half off. And that price is locked in for life. When we raise the price in the future… you will continue to receive this discount. So let me do it for you for $1997 for a full year. That’s the lowest I’ll ever allow this service to be offered at. And an equal amount to get in our recommendations… then you should work on that first. And if you decide it’s not for you then you can contact my associates at 713-636-5658 or use the contact page on the OilPrice.com web site to cancel. When you do you’ll receive an immediate and full refund of your membership. I’m looking forward to welcoming you on board. And we may just get in to the energy stock of the year. Now, I have a special bonus for you today if you are an accredited investor. Or have income of $200,000 ($300,000 combined) over the last two years… along with the expectation of making the same this year. When you order today you’ll also get access to our vetted private placement opportunities for free. We plan to launch this service as a stand alone $9,997 service later this year… but today you’ll get it for free because we want to solicit your input on it. And if, after a year you decide you want to continue receiving private placement recommendations you must call us at 713-636-5658 and explicitly renew. If you’re not yet an accredited investor… let’s make that your goal. And be able to gain access to this completely new way to build wealth. These are the types of deals that could turn a $25k - $100k investment into a million or more. And you'll get the best completely vetted opportunities our network can find. Also, I have one more surprise for you. As we’re rolling out our public wing of OilPrice.com we’re putting the final touches on a complete educational series about the worlds energy markets. Decipher the oil & energy terminology... or special language energy insiders use. Read between the lines of company announcements and reports. Use a simple step-by-step process to evaluate an energy stock. See through an unscrupulous operators discovery announcements. To find outside-the-market oil & gas investing opportunities. Track the best… and avoid the worst… energy ETFs. Invest in energy outside of North America. Perform a simple step-by-step proprietary valuation of any energy company. A detailed guide to Investing in liquid natural gas companies. Our goal is not only to help individual investors profit from the energy market… but to understand how it really works too. When we release this in a few weeks we’re planning to sell the entire 10 volume series for $497. But if you order right now I’ll give you complete access for free. You can keep the reports we’ve sent even if you decide to cancel. I’m simply requesting your input. Tell me what you learned… what you wanted to learn but didn’t… and what I can do to improve it before we release it. So, let’s get cracking… click the order button to become a member. One you do, you’ll receive a personal welcome message from me welcoming you to the Special Situations service. After that, keep an eye on your inbox over the coming days for your first Special Situations recommendation. We have three opportunities right around the corner. Two could rise 50% or more soon… and one could rise 200%... and more if oil prices do. Also, you’ll receive an additional email about our private placement service (a $9,997 value for free)… as well as access to our educational series (a $497 value for free). Finally, I only ask one thing in return if you are able to grab a membership today. Please keep all of our research and recommendations strictly CONFIDENTIAL. We… and you don’t want our asymmetric information advantage to get out beyond our little group. If memberships are still available, they're only a click away. And welcome to the OilPrice.com network.